WIN a $1,499 Kenwood kCook KMS Multi Smart With Marley Spoon! 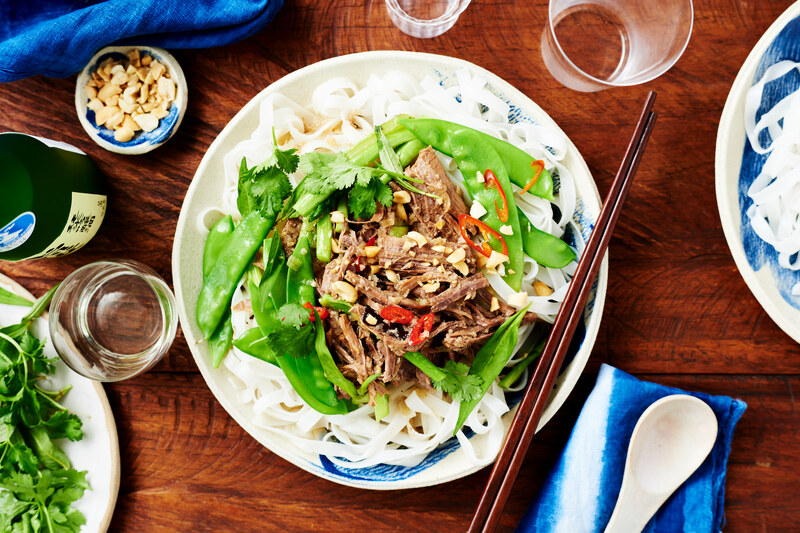 Read on for more information on how to prepare our delicious Asian Braised Beef in Coconut Water and Chocolate and Cherry Self-Saucing Pudding using a slow cooker! While most braises can be rich, we've kept this irresistible Asian meal light with coconut water, star anise and cassia bark. 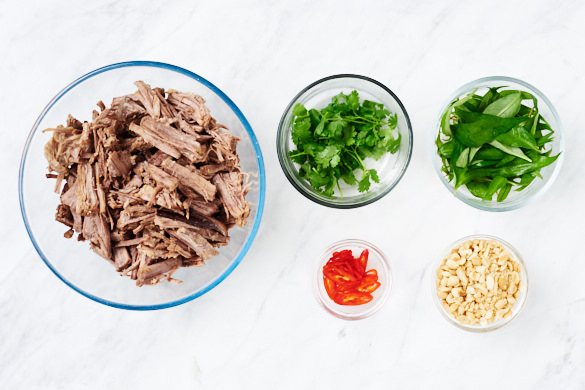 As it simmers, the aromatic stock infuses the beef brisket, then reduces into a fragrant broth to serve with gluten-free rice noodles, roasted peanuts and crisp greens. The best part? A slow cooker does all the work for you, which means prep, step away and enjoy more time with guests. Peel and finely grate the ginger. Crush or finely chop the garlic. Thinly slice the banana shallots. Cut the beef brisket in half lengthwise, then in quarters crosswise (approximately 5cm chunks). Put the ginger, garlic, shallots, beef, coconut water, star anise, 2 cassia bark sticks (reserve the remaining stick for the dessert), fish sauce and 2 tbs raw sugar in a slow cooker. Cook, covered, on low heat for 8 hours or until the beef is very tender (it will almost be falling apart). Meanwhile, trim the snow peas, removing the string from one side. Trim the Chinese broccoli, then cut into 5cm lengths, keeping the leaves and stems separate. Coarsely chop the peanuts. Pick the mint and coriander leaves, discarding stems. Thinly slice the chilli on an angle. Remove the beef from the braising liquid with a slotted spoon and set aside. Increase the slow cooker heat to high. Whisk 1 tbs cornflour and 125ml (½ cup) of the braising liquid until smooth. Stir the cornflour mixture into the braising liquid in the slow cooker and cook, uncovered, for 15 mins or until slightly thickened. Meanwhile, put the rice noodles in a heatproof bowl, cover with boiling water and stand for 12-15 mins until just tender. Drain, refresh under cold water and drain again. Coarsely shred the beef. Add the beef, snow peas, broccoli stems and broccoli leaves to the broth and cook for 5 mins or until the vegetables are tender and the beef is warmed through. Divide the noodles, beef, vegetables and broth among bowls. Scatter with the herbs, peanuts and chilli to serve. 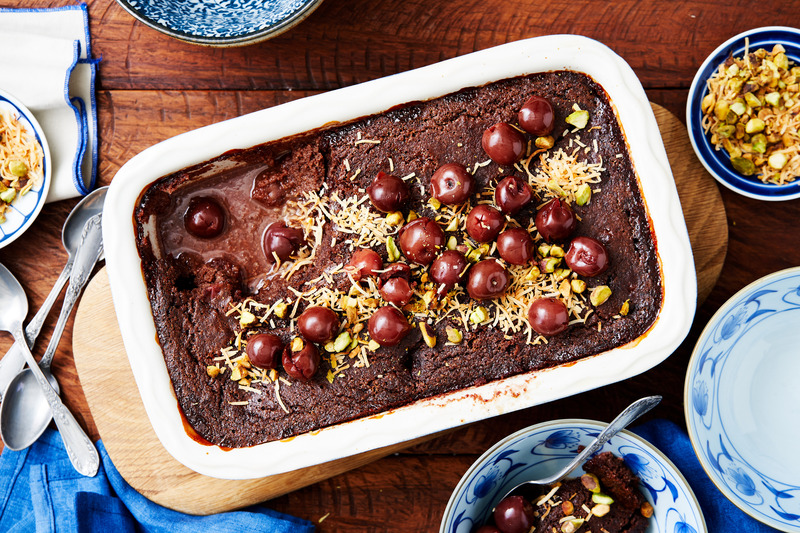 Starring naturally creamy coconut, rich Dutch cocoa and nutty almond meal in place of heavy dairy, chocolate and flour, this gooey, saucy, gluten-free pudding studded with sweet morello cherries follows in the same spirit as the main - light, easy to whip up and downright irresistible. Simply pile into a slow cooker, set the timer and dish up two hours later. Lightly grease the slow cooker. Drain the cherries in a sieve over a small saucepan to catch the juice. Set the cherries and juice aside separately. Put the almond meal, cocoa powder and baking powder in a large bowl and stir well to combine, making sure there are no lumps. 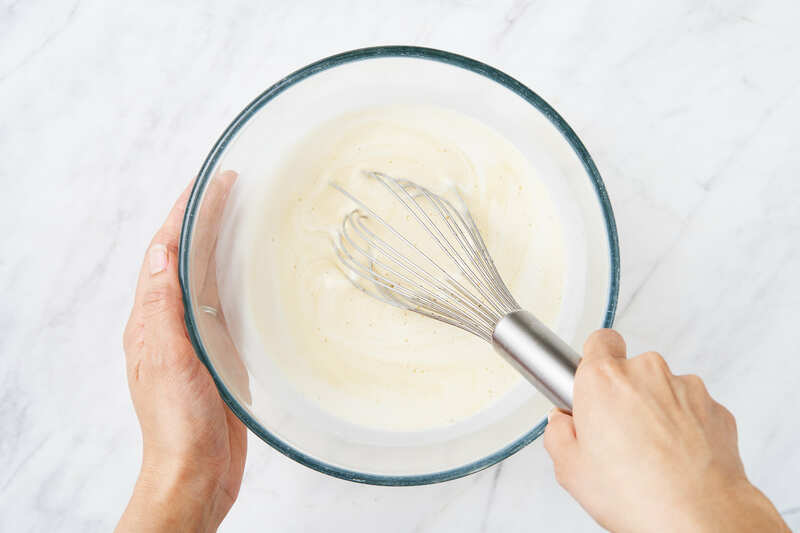 Put 2 eggs, 270ml of the coconut milk (the remaining coconut milk won't be used in this dish) and 2½ tbs of the maple syrup in a separate bowl and whisk until well combined. Add the remaining maple syrup, a pinch of salt and the cassia bark stick (reserved from the recipe bag) to the cherry juice in the saucepan. Bring to the boil, then strain the hot syrup over the batter. Cook the pudding on low heat for 2 hours or until the pudding is just firm to the touch. While the pudding is cooking, put the pistachios in a cold medium frypan over medium heat. Toast, tossing, for 3-4 mins until evenly coloured. Transfer to a board to cool. Add the coconut to the pan and toast, tossing, for 3-4 mins until golden. Transfer to a bowl. Coarsely chop the pistachios. Scatter the pudding with the pistachios, coconut and remaining cherries, then divide among bowls to serve.